The Klamath Vacationer brings you the latest additions to our family's experiences as we discover new Klamath Vacations. If you like this e-zine, please do a friend and us a big favor and "pay it forward". If a friend did forward this to you and if you like what you read, please visit our home page and subscribe. The Umpqua River Waterfalls are an easy day trip from Klamath Falls, Oregon. 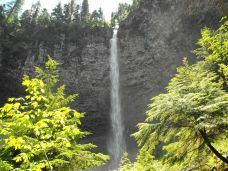 The 4 closest waterfalls are Clearwater Falls, Whitehorse Falls, Watson Falls, and Toketee Falls. Several people have asked me - how do you make money on your website? We explain what Google Ads are and how they work. You can always read about what's new by checking out The Klamath Blog page. We have added more photos to the Klamath Photos page. Send me an email if you would like to add your photo of the Klamath Basin and the surrounding area to this page. The page with the most views is the Ella Redkey Pool page. It has the latest pool schedule and prices. We recently spent the night at the Pinehurst Bed and Breakfast on Hwy 66 west of Keno. We added a link to their website on the Hotels and Lodging page under the Bed and Breakfast heading. We will be adding a page detailing our stay at the Pinehurst Inn Bed and Breakfast. We also plan to add a News and Events page where you can share news and events of what's happening in our area. We will be returning to the Lava Beds to do more caving soon and sharing about our experiences in some of the more difficult caves. We are also planning to return to Crater Lake to go on a boat tour. We'll be sharing that experience along with photos. Dan is also planning to go for a swim in Crater Lake! This section asks you to find a particular person, object, or phrase located somewhere on our site. The Umpqua River Waterfalls stretch along highway 138 and are an easy day trip from Klamath Falls, Oregon. The 4 closest waterfalls are Clearwater Falls, Whitehorse Falls, Watson Falls, and Toketee Falls. We like to pack a lunch and go to either Clearwater Falls or Whitehorse Falls and watch the waterfall while we eat. Clearwater Falls is our favorite picnic site of the four Umpqua River waterfalls. There are several picnic tables to choose from and each one has a clear view of the waterfall. Be sure and have a sweater or light jacket because it can be cool in the shade and near the water. Whitehorse Falls also has a couple of picnic tables and the waterfall is very close. Overnight camping is also available at these two waterfalls. Watson Falls and Toketee Falls are the next two waterfalls. Both require a moderate hike to get a closer view. Watson Falls is the highest waterfall in southwest Oregon at 272 feet. The trail is a steady incline but there are several benches along the trail to rest and catch your breath. The final bench is near the base of the waterfall and we like to follow the water as it falls from the ledge to the rocks below. The trail to Toketee Falls reopened in May. It had been closed for several years due to damage from heavy snow. It is .4 miles long with several sets of stairs and hand rails. The trail ends at an overlook of the double falls. Toketee Falls are two-tiered and can be viewed from the newly rebuilt observation deck. Plan on this day trip taking 6 or 7 hours since the first waterfall is approximately an hour and a half drive northwest of Klamath Falls. Take Highway 97 North and then take a left on Highway 138. Go past the Northern Entrance to Crater Lake and the exit to the Diamond Lake Resort. Proceed approximately 9 miles until you arrive at the first waterfall - Clearwater Falls. Google Ads or AdSense is a free, simple way for website publishers (like myself) to earn money by displaying targeted Google ads on my website. When a web page is displayed Google decides which ads best fit the keywords and feel of the page and displays the appropriate ads. As the website developer I have very little control over what ads appear. I can control the categories but not the content. Whenever someone clicks on one of the links Google pays me (usually less than a quarter) for putting their ads on my website. There is one limitation - I cannot click on any Google Ads on my website. It is OK, however, if you do, if you see something that interests you. The Klamath Blog page is updated every time a page is changed or a new story or review is added. It displays the date when the page was updated along with a brief description of the page. The Ella Redkey Pool page is now a link directly from the Home page. Since adding the page it has become the most visited page on Klamath-Vacations.com. The page is also ranked as the #1 page in the all the search engines. That's exciting! We have recently added pictures to the The Klamath Photos page of our trip to the Umpqua River Waterfalls, of our outing to Kiger stadium, and the before and after pictures of midges. If you would like to add your photos to this page send me an email with the photos attached (higher resolution is better!). I will re-size the picture(s) and add your name and your photo name. Please use the email link on the Klamath Photos page to submit your photos. As more and more pictures are added I plan to make a page of just Crater Lake pictures, Lava Beds, etc. We have also been exchanging links with several other websites and displaying their links on my Klamath Travel page. These links provide travel information to locations in the US and Canada, to countries around the world, and helpful hints for the traveler. Two new pages are in the planning stage - Pinehurst Inn and News and Events. We highly recommend an overnight stay at the Pinehurst Bed and Breakfast or when going out for a romantic candlelight dinner. We recently went to celebrate the anniversary of our first date. We took advantage of their $99 special which included dinner, overnight, and a continental breakfast. For dinner we ordered anything off the menu. The only thing not covered was alcoholic drinks and dessert. We had neither and still had a great dinner. The salad was exceptional with fresh greens. Judy ordered the London Broil (the Special) and I ordered the 10 oz. New York Steak. After dinner we were treated to a special number on the upright piano by our waiter (who also is the owner). Each of the rooms has its own private bathroom with a claw-foot tub and bubble bath. Our room had a queen size bed. The continental breakfast featured just about anything you could want from fresh fruit to any kind of bread, cereal, yogurt, jams, etc. The News and Events page will include articles about one-time events in Klamath Falls, Klamath County, and Northern California. Most of the articles will center around a special event that a visitor might like to attend - the Klamath Kruise, the Klamath County Fair, Civil War reenactments, or special events at Crater Lake or the Lava Beds. In the last e-zine we asked the question - Did you know that there is a picture of "Flat Stanley" somewhere on our web site? No one sent in the correct response. He is located on the Klamath Weather page. Laura is holding him next to the City of Sunshine sign. Also on the weather page is the current temperature for Klamath Falls, Oregon, provided by The Weather Channel. Click on the link to see the Hour-by-hour temperatures or the 10-day temperatures. Comments? Ideas? Feedback? We'd love to hear from you. Just reply to the e-zine and tell us what you think!